Please visit http://srivaishnavagranthams.wordpress.com/purvacharya-literature/ for most upto date list. While vEdham is just one vast body of scripture, vEdha vyAsa, considering the limited capacity of human intelligence in the future, divided the vEdham in to rig, yajur, sAma and atharva vEdhams. brahma sUthram that is compiled by sage vEdha vyAsa is also considered to be part of vEdhAntham since it is the essence of upanishadhs. Since, vEdham is anantham (endless - huge) and vEdhAntham is very complicated and the capacity of human intelligence is limited (which can lead to misunderstandings and misinterpretations), we have to understand vEdham/vEdhAntham through smruthi, ithihAsam and purANams. smruthi is the collection of dharma sAsthrams which are compiled by great sages like manu, vishNu hAritha, yAgyavalkya, etc. ithihAsams are the collection of srI rAmAyaNam and mahAbhArtham - the two great epics. srI rAmAyaNam is considered as the sharaNAgathi sAsthram and mAhAbhAratham is considered as panchamO vEdham (fifth vEdham after the rig, yajur, sAma and atharva vEdhams). purANams are the collection of 18 main purANams (brahma purANam, padhma purANam, vishNu purANam, etc) and many upa (minor) purANams which are compiled by brahmA. Of these 18 purANams, brahmA himself declares that when he is in the mode of sathvam (goodness) he glorifies vishNu, in the mode of rajas (passion) he glorifies himself and in the mode of thamas (ignorance) he glorifies shiva, agni, etc. Even with the existence of all of these, instead of gaining true knowledge through sAsthram and look out for the true goal, samsAris were still engaged in materialistic aspirations. emperumAn then personally descended as many avathArams, only to see many disrespecting him and even fight with him. Realizing that he should prepare a jIvAthmA to help the samsAris (like a deer is used to capture another deer by a hunter), he picked a select few jIvAthmAs and gave them blemishless divine knowledge. These jIvAthmAs became to be famously known as AzhwArs (ones who are immersed in bhagavath anubhavam). They are headed by nammAzhwAr (prapanna kula kUtasthar/vaishnava kulapathi) and are said to be 10 in number - poigai AzhwAr, bhUthath AzhwAr, pEyAzhwAr, thirumazhisai AzhwAr, nammAzhwAr, kulasEkara AzhwAr, periyAzhwAr, thondaradippodi AzhwAr, thiruppANAzhwAr and thirumangai AzhwAr. madhurakavi AzhwAr (disciple of nammAzhwAr) and ANdAL (daughter of periyAzhwAr) are also added into AzhwArs goshti at times. 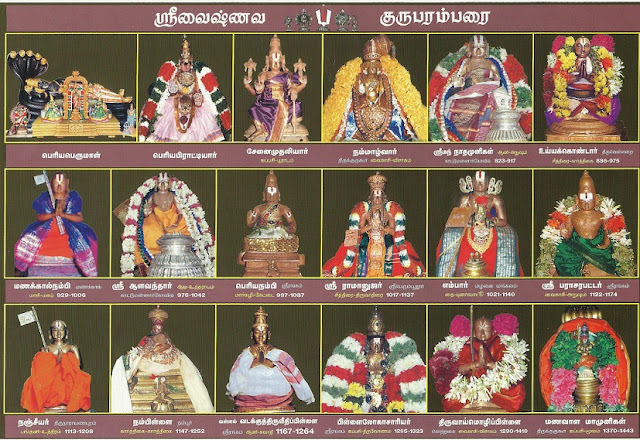 AzhwArs who were fully blessed by emperumAn preached the divine knowledge to many. Still, since they were immersed in bhagavath anubhavam their focus was on mangaLAsAsanam to emperumAn. emperumAn, wanting to uplift more jIvAthmAs from samsAram, divinely arranged the appearance of AchAryas starting with nAthamunigaL and ending with maNavALa mAmunigaL. emperumAnAr who is an avathAra visEsham of Adhi sEshan, appears right in the middle of our AchArya paramparai and he brings this srivaishnava sampradhAyam and visishtAdhvaitha sidhAntham to great heights. Following the works of great rishis parAsara, vyAsa, dramida, tanka, etc., he firmly establishes the visishtAdhvaitha principles. He establishes 74 AchAryas as simhAsanAdhipathis and instruct them to bring srivaishnavam to everyone who has the desire to learn about emperumAn and gain true knowledge. periya perumAL accepts maNavALa mAmunigaL (who is yathi punaravathAram - rAmAnujar's subsequent avathAram) as his own AchAryan in srIrangam periya kOil and completes the AchArya rathnahAram which started from him. After the time of maNavALa mAmunigaL, his main disciples, famously known as ashta dhik gajangaL (eight elephants) headed by ponnadikkAl jIyar further propagate the srivaishnava sampradhAyam everywhere. Subsequently, many AchAryas appear in this sampradhAyam and continue the great work of our pUrvAchAryas. One of the greatest and unique gifts/wealth our AzhwAr/AchAryas have left behind for us is the amount of divine granthams which are full of true knowledge and which focusses only on the upliftment of us (the jIvAthmAs who are bound in this samsAram). It is very difficult to grasp the main principles from the vast vEdham/vEdhAntham and complicated purANams/ithihAsams (due to some seemingly contradictory statements). On the other hand, our pUrvAchArya srIsUkthis are made with the intent to clearly deliver the important principles such as supremacy of srIman nArAyaNan, our svarUpam, our relationship with him, the ultimate goal, the process to reach the goal and the hurdles in accomplishing the goal and method to avoid those hurdles. No other sampradhAyam has such unbroken lineage of AchAryas and such variety of divine literature. Let us see a comprehensive list of all the srIsUkthis of our AzhwAr/AchAryas. It is unfortunate that we dont get a lot of these granthams any more. Some of them were lost during the invasions that happened in south India. But, even if we study the granthams which are available now (which are still plenty), we will definitely be greatly benefitted by the spiritually potent content of these granthams. Puthur Raghuram swamy (author of srIsailEsa dhayApAthram magazine) recently published a grantham named pattOlai (based on old manuscripts) which identifies a comprehensive list of pUrvAchArya granthams. To read that click https://docs.google.com/file/d/0ByVemcKfGLucVGV2X2h4dUU2Skk/edit?usp=sharing. sudharsanar trust (http://srsktrust.com/) - No: 3, Puthur agraharam, Puthur, Trichy -17. Ph: 91-(0)431-6544494, cell: 72000 29495. Many books are available for download at http://acharya.org/sloka/shlokas-al.html. Request all srivaishnavas to send me an email, if any pUrvAchArya granthams is missed in this list or if there is a link that is available online (for download/view) for any of the listed granthams. Swami, thanks a lot for the expansive list... I feel so blessed to be born in this illustrious Sampradayam... unmatched in Devotion, Scholarship, Humanity and Compassion. Graet Effort! May Divya Dampatis bless you in all your endeavours! no words to express our gratitude. excellent work. thanks for the feedback. actually, more updates (with some valuable addition) are coming in this page in the near future! Skydrive storage was lost some time ago - we no longer have access to those files. Please visit http://srivaishnavagranthams.wordpress.com/purvacharya-literature/ for most upto date list.